BU Today profiles Jessica. November 14, 2016. Jessica testified before the Senate Homeland Security and Government Affairs Committee at the hearing “Inside the Mind of ISIS: Understanding Its Goals and Ideology to Better Protect the Homeland.” January 20, 2016. Michiko Kakutani recommends “ISIS: The State of Terror” in the New York Times’ Top Books of 2015. December 10, 2015. 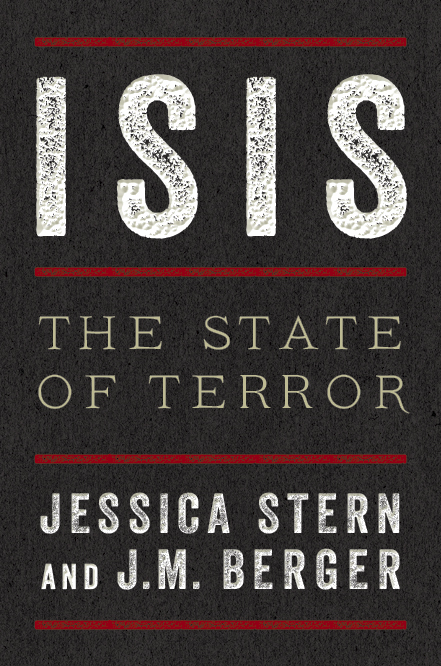 The Washington Post names “ISIS: The State of Terror” notable non-fiction of 2015. November 18, 2015. The Wall Street Journal names “ISIS: The State of Terror” “one of ten must-read books on the evolution of terrorism in the Middle East.” November 17, 2015. Boston University profiles Jessica’s new appointment as a Research Professor at the Pardee School of Global Studies. November 11, 2015. Nieman Scholar cites “Denial: A Memoir of Terror” as a must read narrative. Septmeber 9, 2014. Appearance on PBS NewsHour on foreign fighters in the Islamic State. Interview with Gluck Radio on the realities of PTSD. August 1, 2014. Interview with NPR’s Rachel Martin on the meaning of Al-Qaeda’s split with the Islamic State of Iraq in Syria. February 9, 2014. Keynote lecture at the Symposium on Guilt and Shame in Amsterdam, Netherlands. January 15, 2014. Appearance on the BBC’s NewsHour program discussing Al Qaeda’s revival and the extent to which it is linked to the Arab Spring. January 3, 2014.